Once every summer, a band of gamers brave the blazing heat to meet up and celebrate all things Rockman in Akihabara, Japan. 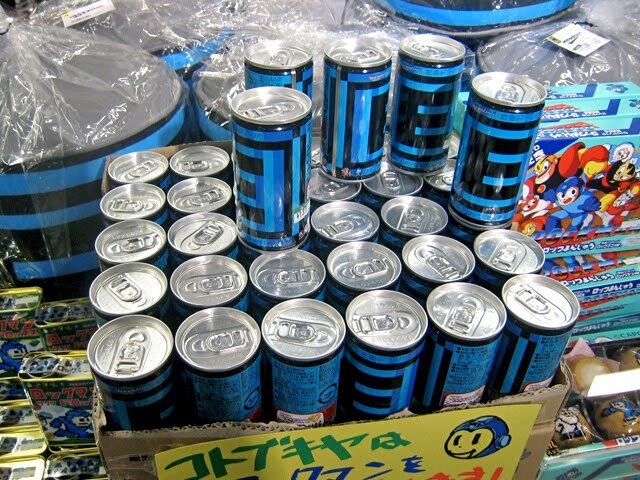 Dubbed the "Summer of Rockman", these Blue Bomber nuts participate in competitive speed runs, blast chip-tune music into the busy streets and indulge in all sorts of other nifty activities. 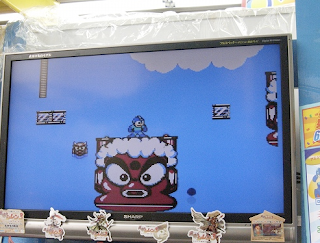 This year's festivities kicked off a couple weeks back, largely centered around a Rockman 2 competition. In total, there were sixty something fans who participated, with passerbyers stopping to give it a whirl throughout the day. Retailers get in on the fun, too; a nearby game shop put together a kiosk filled to the brim with Rockman merchandise, all for sale. More photos available here. Thanks to Joshua for the news and images! 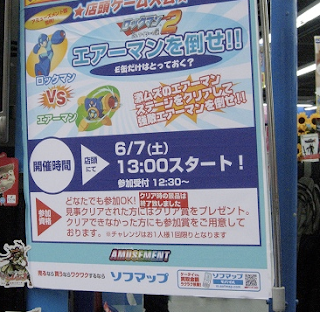 "It certainly looked like a lot of fun; really makes me wish those outside of Japan had a similar venue to meet up with other fans..."
"This year's festivities kicked off a couple weeks back, largely centered around a Rockman 2 competition." Aaaaaannnnd this is where I stopped reading. Oh, Krazy Monkey, you so krazy. Don't get me wrong, though. That's just my Mega Man 2 bias talking. For the most part, though, I think this celebration is an interesting concept. I LOL'd at the contest description which is to beat the 'difficult' Airman. Come on guys. Yes they play it to death, but Mega Man II remains a fantastic game. If you stop reading articles at a mention of the game, you're a rather childish individual. The game deserves it's praise. It's far more annoying when a game gets a reputation like this, and doesn't deserve it. I'm looking at Final Fantasy VII. I don't mean to start a flame war, but all I'm saying is that when it comes to monstrously huge reputations, you can do a lot worse than Mega Man II. 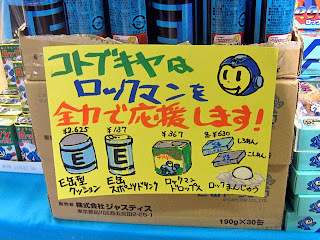 Oh, and another thing... Now that you mention it, what's so difficult about Air Man, anyway? His difficulty (in addition to the game itself) is extremely overrated. I was able to single-handedly kill Air Man with just the Mega Buster before, and I did it without breaking a sweat. I'm sorry, but Mega Man 2 is just NOT that great. 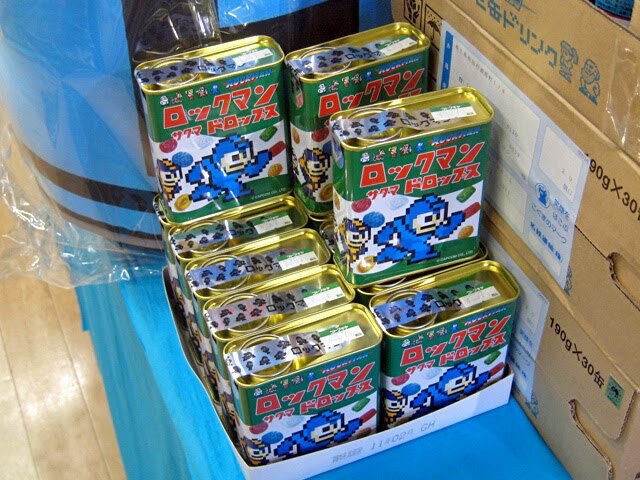 There are many other games in the series (Mega Man 3 and onward) that have surpassed it in almost every way. Unfortunately, all of those games (especially Mega Man 7, 8, and Mega Man & Bass) get ignored in favor of Mega Man 2's broken Robot Master weakness cycle, as well as its shoddy level designs, which I have no qualms in calling the worst in the series. While the game (to some extent) was a step above Mega Man 1, the game is just WAY overhyped, and I'd say that it's very well up there with the likes of Final Fantasy 7, as far as undeserved popularity is concerned. Both Mega Man 2 and Final Fantasy VII are incredibly overrated. FF VII more so than MM 2, though. I'd have to disagree with the two of you when it comes to Mega Man II's level of quality. It's a great game even if it's successors top it, just as it topped Mega Man 1. No one can deny that it introduced most of the staples of the franchise. That is something that not many other Mega Man's can claim. I have to mention that when Mega Man II was released, there were only TWO games. The formula was far from set in stone. That's just as unrealistic of a complaint as hating on Zelda II for being a side-scroller. It didn't break the Zelda formula, because there wasn't one. I found that the weakness cycle was superior in Mega Man II, than in the other games. It makes sense that the Robot Masters are vulnerable to more than one weapon, but none as much as their main weakness. It just made more sense. But this only mattered for one more game anyway, since after III you could charge your buster and the point was lost entirely. The chargeable buster is far more upsetting to the weakness cycles than each Robot Master being vulnerable to more than one weapon. But just so you know, I do not, in fact, find Mega Man II to be the best in the series, and I absolutely loved Megaman 7, 8, and "& Bass" to death, and am right there with you that the general hatred toward these three is an injustice. And also, Final Fantasy VII is simply a horrible game, which no one can say about Mega Man II. Blech. I just knew someone was gonna whine about it being MegaMan II. Get over it already. You're not changing people's opinions, and they're not changing yours. So just leave it at that. Please? Though I suppose it wouldn't hurt to have a choice between a couple of games at something like that, even if there's only 3 or something at most. 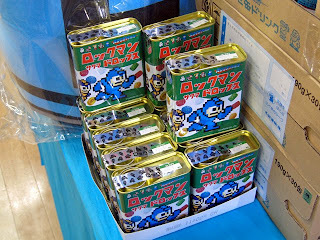 If everyone is finished whining about MMII, then may I whine about the merchandise? Thank you. 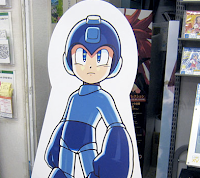 Guess I don't even have to be here anymore for people to argue about Rockman games anymore. See? See? And you guys make it sound like I'm some evil guy! On another note, this event looked like it'd be pretty fun. 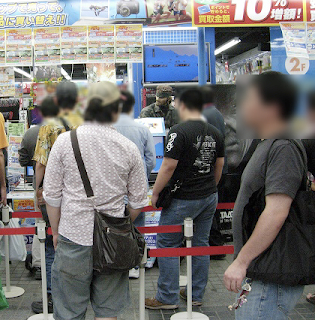 I wonder if the people there busted out their GBAs and DSes for some Network/Shooting Star battles, too. Just one more thing from me, and it's that "whining" and "defending a fine game from immature hatred" are two entirely different things. On topic, I really wish that this was done in other regions too. I would love to take part in something like this. 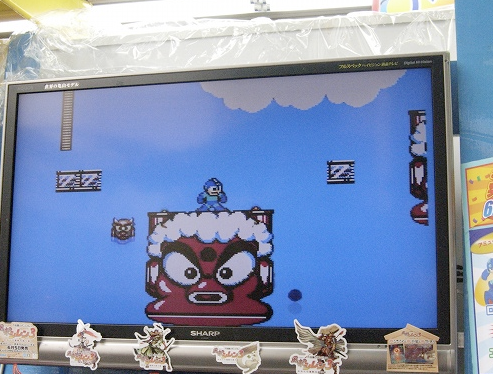 Wait a minute, are they playing Mega Man 2 in widescreen? How did they do that? Is the image stretched or something? Everything you say is rude and evil, plus you keep talking about Star Force and Battle Network is supior to the other MegaMan games. Don't get me wrong, I like Battle Network and Star Force, but I don't like when someone *Cough! Saito Cough! * keeps talking that Star Force and Battle Network is better than the other MegaMan series. 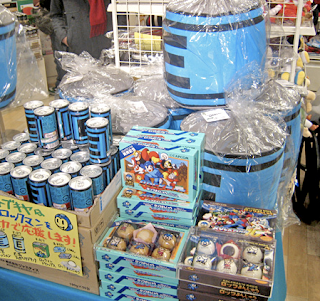 The kotobukiya in Akihabara has had E-can cushions and Rock-manjuu and other Rockman goods up like that for a while now. I wasn't in Tokyo when the tournament went on, but it sounded kind of interesting. If only Tokyo were a better place I would go up there more often. But I wouldn't want to live in Tokyo. It would be no different from living someplace like America. Too many people in general, and too many weird people walking around. Not once did I ever do such acts of trying to say SSR and EXE are superior to the others. However, much like an FF7 and Sonic fanboy, lots of the Megaman community like to try and shift words around in their head and make it sound like something else. Too bad, it doesn't work with smart people. BTW my Word Verification is: "undress"
It's a reference to a certain memetic song. If you still remember it, that is. Ok I am pretty annoyed. 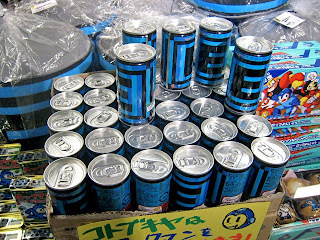 I am a HUGE megaman fan, I am living in Japan, I had 4 days off this weekend for the festival, AND I was even invited to Tokyo but I turned it down. Had I known this was happening I would have went. DAMN! !